One of the two versions of Domenico Feti's Melancholy painting (I believe this is the second version c.1622, Oil on canvas, 179 x 140 cm, in the Accademia collection, Venice), posted this Tuesday. This is the final ceramic work that I'm making for Malfunction Baroque at The Rayner Brothers Gallery in Whanganui. I've recently had all the completed works fired and with an eighty-percent strike-rate, am pretty happy with the outcomes. 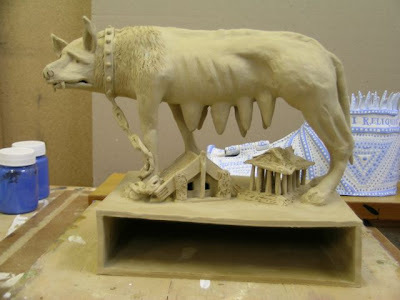 This last works is based on the Capitoline She-wolf but with Rom and Rem replaced. I seperated the box based from the wolf so that it wouldn't slump in the firing. Now I'm working on whether or not I should re-attach it. Here's a retablo that I've been working on that relates to this piece.